Los Angeles band Blondfire makes pretty dream pop with an electronic flare. Think the lovechild of Metric and Stars. The brother sister duo have a diverse background, growing up in Michigan but rooted in Brazil. Similarly, their music carries a comfortable yet exotic vibe. Their second LP Young Heart, out on Tender Tender Rush, kicks things up a notch from their 2008 debut with catchier hooks and addictive synth. The band manages to progress while still maintaining that “go and get it” attitude. The album begins with the whimsical “Young Heart”, which sets the tone for the rest of the album: an ethereal, electronic heartbeat. Standout of the album “Where The Kids Are” combines echoey synth with strong electric guitar to make a track worthy of the repeat button. Near the middle the album things slow down a bit and tempos begin taking their time. Tracks such as “Hide and Seek”, “Kites” and “Wild and Wasted” enable a break until “Life of the Party” picks things back up. 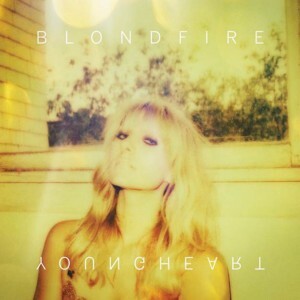 If you’re looking for feel good, whimsical ear candy, look no further than the new album from Blondfire.